The Cowboys waived Williams (undisclosed) from injured reserve Saturday, per the league's official transaction report. Analysis: Williams spent last season on the Cowboys' practice squad and could have the same role when he's healthy again. His last NFL experience came in 2015, when he suited up for two games, rushing twice for 12 yards. Williams (undisclosed) cleared waivers and reverted to injured reserve, according to the league's official transaction log. Analysis: The nature of Williams' injury isn't clear, but the running back is nonetheless stuck on IR through the end of the league year unless he agrees to an injury settlement. 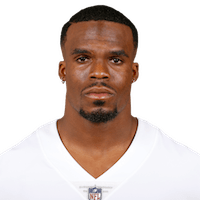 Williams signed a contract with the Cowboys on Saturday, David Helman of DallasCowboys.com reports. Analysis: Williams had just been released by the Cowboys on Thursday, but was brought back to Dallas just two days later after clearing waivers. He'll be a longshot to make the 53-man roster, but could be a candidate for the practice squad again this season. Williams was waived by the Cowboys on Thursday, Todd Archer of ESPN reports. Analysis: Williams signed a reserve/future contract back in January, but with the Cowboys' fairly deep running back depth chart, the 25-year-old was always a long shot to make the 53-man roster. If Williams clears waivers, he could end up back with Dallas after spending a chunk of last season on the team's practice squad. There are no videos available for Trey Williams. Click here to view all videos.